Friends are the sunshine in the garden of life! 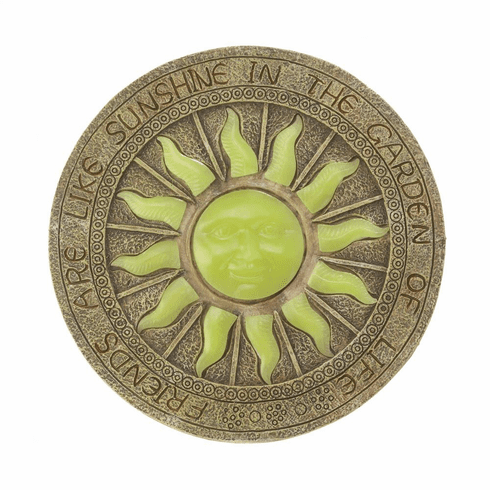 This cool garden stepping stone features a bright yellow sun that soaks up sunlight by day and then glows by night. It will be the perfect addition to your garden path. Weight 2.8 pounds. 10.2" x 10.2" x 0.5". Polyresin. UPC Number: 849179031121. Friends are the sunshine in the garden of life! This cool garden stepping stone features a bright yellow sun that soaks up sunlight by day and then glows by night. It will be the perfect addition to your garden path. Weight 2.8 pounds. 10.2" x 10.2" x 0.5". Polyresin. UPC Number: 849179031121.